On Mayday of 2009, members of Russian section of IWA participated in some actions. A group of our members posted a banner «We are solidary with Visteon workers. IWA» facing of «Ford Motors» partner office at Volgogradsky prospect in Moscow. Nobody was arrested. 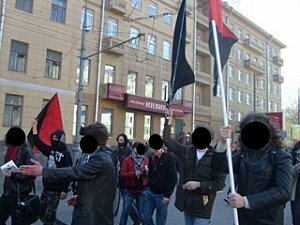 The members of CRAS-IWA and some other anarchists build a «red-black» group (about 20 persons) in general Mayday demo in Moscow. We kept red-black flags and distributed our papers and leaflets with calls for independent resistance against capitalism and state, for struggle against arbitrariness of police, «laws of market», wage system and politicians, for free associations, self-organization and self-administration. Our members participated also in general anarchist meeting-concert (street-party) in Moscow together with 250-300 other anarchists and antifascists.